International contributors, providing a wealth of easily accessible knowledge, consider this extremely heterogeneous group from neurological, behavioural, socio-political, service user, psychodynamic and systemic perspectives. Sally Austen is a Consultant Clinical Psychologist and author who has specialised in the field of mental health and deafness for 15 years. She has worked with deaf people with mental health problems, deafened adults in health psychology and audiology problems, deafened adults in health psychology and audiology fora and with cochlear implant programs. She has special interest in the prevention of mental health problems in deaf people, non-organic deafness and interpreter training. Dave Jeffery is a Violence and Personal Safety Specialist Advisor and has worked with deaf people for ten years. He is currently employed by Birmingham and Solihull Mental Health Trust Risk Management Department. I. Introducing Deafness and Challenging Behaviour. 1. The Deaf Service User’s Perspective of Challenging Behaviour and Restraint (Sally Austen and Two Service Users). 2. Unravelling the Anomaly of Deafness (Di Baines). 3. Bearing Witness: Challenging Behaviour and its Contribution to Trauma and Vicarious Trauma (Dave Jeffery, Marian Crowley and Sally Austen). 4. 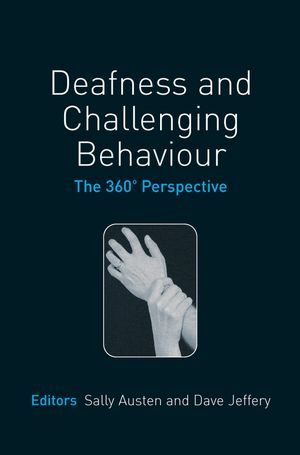 Diagnosis and Challenging Behaviour of Deaf People (Sally Austen, Alison Gray and Steve Carney). II. Aetiology of Challenging Behaviour. 5. Challenging Behaviour in the Young Deaf Child (Rosie Kentish). 6. Neuropsychological, Behavioural and Linguistic Factors in Challenging Behaviour in Deaf People (Robin Paijmans). 7. Psychodynamic Approaches to Understanding Challenging Behaviour (Christine McPherson). 8. Autistic Spectrum Disorder, Deafness and Challenging Behaviour (Pat Collins and Steve Carney). 9. Challenging Behaviours and Deaf Older Adults (David M. Feldman and Kristyn Eck). 10. De-escalation and Deafness: Seeing the Signs? (Dave Jeffery and Sally Austen). 11. Showing Restraint: Therapeutic Holding with Deaf People in Crisis (Dave Jeffery). 12. A Model for Restraint Prevention in Residential Treatment for Deaf Children (Judith Vreeland). 13. The Role of Deaf Staff and Interpreters in Preventing Challenging Behaviour (Adrian Harper and Mary Connell). 14. Social-skills Improvement as a Means of Managing Challenging Behavior (Marlene Eernisse and Leigh Poole Warren). 15. Approach with Care: Improving the Effectiveness of the Care Programme Approach with Deaf Service Users in the UK (Dave Jeffery). 16. Deaf People and the Criminal Justice System (Sue O’Rourke and Rebecca Reed). 17. High Secure Care for Deaf People in England and Wales (Manjit Gahir). 18. Risk Assessment and Risk Management with Deaf People (Sue O’Rourke).